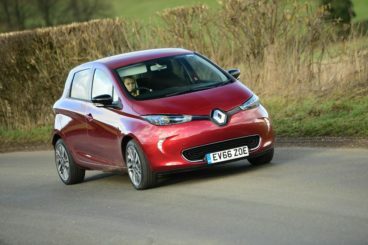 The new Renault Zoe Hatchback is a stylish, affordable EV that’s great in the city and has good range. For first-time buyers or daily commuters, it’s a very attractive package. Renault is the go-to brand for anyone who’s considering making the switch to all-electric. Their Zoe supermini sports the same measurements as the popular Clio, but with the battery pack tucked underneath the floor, it can boast plenty of interior space. Add a low centre of gravity that improves drivability, and you’ve got an environmentally-friendly, fun-loving car on your hands. It’s just like a normal supermini, but greener. OSV takes a closer look at what it’s all about with our 2017 Renault Zoe Hatchback review. Moreover, the steering is both precise and light, and it’s on the whole a relaxing car to be in. If anything sets it apart from petrol and diesel superminis, it’s how quiet it is on the move. At lower speeds, however, it has a mosquito hum that helpfully warns pedestrians that it’s here. Its electric motor is nippy and picks up speed well. 0-30mph is done away within 4.0 seconds, while the 0-62mph sprint can be tackled in just 13.5 seconds, before the car maxes out at 84mph. Its electric motor develops up to 88bhp, which is more than enough to see you easily keep up with traffic. Out on the motorway, the Renault Zoe Hatchback is less assured, and its battery will drain quicker. Stick to the towns and cities, though, and you’ll be just fine. It’s not all good news, of course. 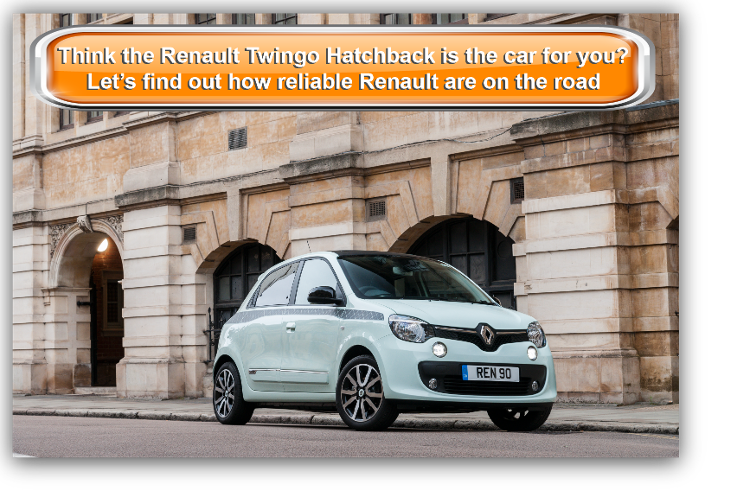 The batteries are heavy, and add as much as 400kg of weight over the Renault Clio. As such, body roll is an issue, and the Zoe struggles to emerge from corners in a hurry. The regenerative brakes are a bit of a problem too – they brake too abruptly. But let’s end on a positive note, because the raised driving height ensures visibility is excellent, while a standard rear-view camera for top-spec models and the cars compact dimensions make it easy to park. One of the biggest selling points of an EV is its super quiet cabin. With no diesel clatter in sight, the Renault Zoe is as serene as they come. The morning commute to work will never be so zen! There is a buzz when you’re at speeds of under 20mph, but that’s simply a safety precaution to warn cyclists and pedestrians. Travel at speeds between 20 and 40mph, and silence is as silence does. Refinement is also good, while decent ride quality contributes to a comfortable cabin. The dashboard just had to look futuristic. Light greys and white plastics make you feel like you’re in a set from a 70’s sci-fi movie, while a large screen that dominates the centre console houses most of the Zoe’s functions. And that 70’s sci-fi movie aesthetic? It will polarise buyers. In terms of how practical it is, its usability was definitely improved when Renault found a good hiding place for the bulky batteries – beneath the seats. Usually, batteries reduce either legroom or boot space, but in this case neither has been compromised. The result is that the Zoe can boast a boot that is larger than the Renault Clio. It measures 388-litres and even comes with a lower loading lip. However, the rear seats can’t be folded entirely flat for when you need more space. Leg and headroom are good throughout, and storage spaces are average. Standard kit in the entry-level model is decent, but you can’t get the most powerful battery with it. However, you do get the brand’s R-Link multimedia system, climate control, voice-activated TomTom sat nav, Bluetooth, and front electric windows. The Dynamique Nav model is a real step up in quality. It adds automatic headlights and windscreen wipers, a more powerful battery that has greater range, keyless entry, rear electric windows, 16” alloys, bespoke upholstery and a leather steering wheel. The Signature Nav model rounds things off with a reversing camera, heated front seats, and a BOSE stereo. Is the car safe? It was awarded all five stars after Euro NCAP put it through its crash-test paces, but it’s a shame that Renault hasn’t included autonomous emergency braking as part of its standard safety kit. Prices for the new car start out from £18,745 and rise to £30,500. If you prefer to lease, you can pick up a deal from £385 + VAT per month. For more information on our leasing deals, check out our page here. In terms of its running costs, while the purchase price of this car is decent, and while there are no fuel costs to pay, the price of batteries is high. However, you can either choose to buy the Zoe with batteries included for the full price, or you can pay a reduced fee and lease the batteries on the monthly. If you choose this latter option, how much you pay will depend on your annual mileage. For example, if you expect to cover less than 4,000 miles a year, you’ll pay £59 per month in lease fees. Cover more than 10,500 miles each year, and you’ll pay £99 per month. Batteries have lifetime guarantees, which means that if a battery fails to charge over 75% on a regular basis, Renault will offer you a new one for no extra cost. With no diesel clatter in sight, the Zoe Hatchback offers a relaxing and refined driving experience. The entry-level model misses out on the most powerful battery, but the brands R-Link infotainment screen is standard on all models, and it comes with downloadable apps, Bluetooth and sat-nav. Hiding the batteries beneath the seats mean both interior space and luggage capacity is good. It’s easy to drive – but not much fun. The sci-fi theme is visually arresting, but the interior is actually really sparse. Let’s see how the car fares against its rivals in the comparison section of our 2017 Renault Zoe Hatchback review. The new Hyundai Ioniq Hatchback is slightly larger than the Clio and comes with the choice of three separate powertrains. For the purpose of this review, we’re focusing on the all-electric variant. In town is where the Ioniq is at its best, where its effortless pulling power and safe but competent handling comes into its own. It’s easy to drive and relaxing to be inside. Acceleration comes easily, and the car always feels well planted. Moreover, body lean is at a minimum. The steering lacks feel, however, which means you can’t always be sure of what your front wheels are up to. It self-centring action, meanwhile, is a bit erratic. The “engine” is an electric motor that’s powered by a 28kWh battery. It produces almost 119bhp, which gives it considerable more oomph than the Zoe. As a result, it can thrust you from rest to 62mph in 10.2 seconds. If you switch to sports mode, you can make it in just 9.9 seconds. The battery isn’t heavy at all, which further boosts drivability – as well as efficiency. 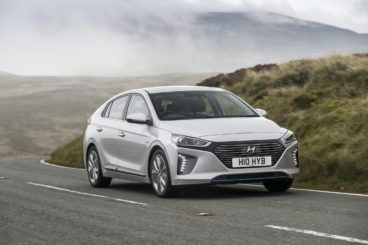 Also boosting efficiency is the Hyundai Ioniq Hatchback’s climate control system which helps you keep going for 174 miles on a single charge. Charge-time is 4.5 hours if you use a 7kWh charger at home, or you could stop off at a CSS rapid charging point and charge as much as 80% of the battery in a little over half an hour. In terms of its interior, the Ioniq looks much more like a conventional Hatchback than the Renault Zoe. While there is no flair, there is still plenty to like. The dashboard is smartly designed and clearly laid out, while copper accents lend the place a bit of atmosphere. There are plenty of soft-touch materials used, and everything feels well put together. Standard kit is good too, and includes Apple CarPlay, sat-nav, and a reversing camera. Like in the Zoe, the batteries are hidden away – this time beneath the Ioniq’s floor. That frees up enough space for five people to get comfortable, though it does impact boot space. The sloping roofline looks like it might diminish rear headroom, but it actually doesn’t. Visibility is aided by large windows, while the boot measures 350-litres. That makes it smaller than the Zoe, despite this being a bigger car. However, Hyundai has tucked the batteries under the boot floor, whereas Renault cleverly did not. Fold the rear seats, and you can extend its capacity to 1,410-litres. The new BMW i3 Hatchback is more expensive than the Zoe, but it’s premium-badged, super fun to drive and oozes personality. It’s also the best-looking car in this review by a long shot. In terms of how it drives, it dazzles. Handling is typically excellent for a BMW, and a lot of the time it feels like a conventional Hatchback – which is no bad thing at all. It’s right at home in the city, where its compact dimensions, sharp steering and raised driving position make it easy to negotiate tight turns. The suspension jolts a bit, but if you need a car to dart in and out of traffic with, the i3 Hatchback is game. It’s also quick. For the purpose of this review, we’re focusing on the all-electric version, but there is also a petrol option available. However, the EV variant is faster, and can complete the 0-62 dash in 7.3 seconds. That makes it a lot faster than the Zoe, and since its power is available at any time, it feels even faster than those numbers suggest! Progress is smooth, and its clever regenerative braking system means your foot is pretty much glued to the brake pedal at all times. Being all-electric means the BMW i3 Hatchback won’t cost you anything in fuel. However, while it’s tax-free for the first year, you will have to contribute £130 per year after the first twelve months. 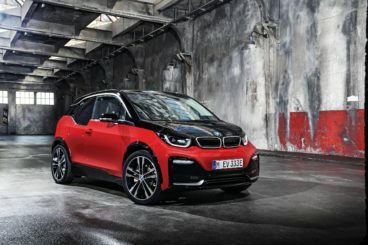 BMW claim it can keep going for almost 290 miles on a full charge, while an 80% charge can be done in just forty minutes if you can find a rapid-charging facility. If you’re charging from home, you’ll be waiting ten hours for a full top-up. Inside, the i3 is spacious and comfortable, and looks as futuristic as the exterior. Insulation is a slight issue, thanks to the cars upright body shape, but it’s more of an issue in rural areas or over bridges. On the motorway, everything soon settles down. 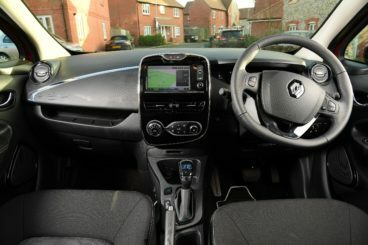 The dashboard gets a couple of hi-tech screens which have made conventional buttons redundant, while the likes of eucalyptus wood are part of what makes this car more expensive (and more alluring) than the Renault Zoe Hatchback. iDrive is standard, as is Bluetooth and a DAB radio. Is it practical? It’s surprisingly roomy, with BMW doing a good job of getting the most out of its compact dimensions. Leg and headroom is fine up front and bearable in the rear, but taller people will struggle. It’s strictly for four people only, and comes without a middle seatbelt. Access to the rear is a bit awkward, thanks to the fact that the rear doors can only be opened once the front doors have been opened. Still, this is a small issue that you get used to. The boot, meanwhile, measures 260-litres, which makes it by far the smallest in this review. It comes without a lip, but if luggage capacity is crucial to you, you’d be best sticking to the more affordable Zoe. More and more of us are ditching petrol and diesel models in favour of battery-powered cars, but is the Zoe the one for you? Range remains a bit of an issue, and in colder seasons the smaller battery will only last around 80 miles before it needs another charge. It’s an odd car to look at too, both inside and out. On the other hand, it’s arguably the best EV for commuters who want to go greener. It’s easy to drive, relaxing, and roomy. The Renault Zoe Hatchback won’t be the best ever HB you buy, but it’s a step in a more affordable, environmentally friendly and different direction.